You can’t teach affability and a willingness to learn – these are the fundamental skills that any prospective hairdresser needs just to get started. On top of that, you’ll need to learn the technical skills – like cutting, colouring and styling hair – that are associated with the job. There are several routes you can take to become a hairdresser. These are the most common ways to get into the industry. Apprenticeships enable you to train on the job whilst gaining the qualifications you need to succeed. Available to anyone aged 16 or over, apprenticeships – like the ones available at Rush – can be used to gain NVQs (National Vocational Qualifications) or VRQs (Vocationally-Related Qualification) whilst getting some hands-on experience in a professional setting. Usually, apprentices will work in a salon four days a week, then spend one day a week at a college or training academy. You’ll usually need some GCSEs for an intermediate apprenticeship, and at least 5 GCSEs at grades 9-4 (or A* to C) if you want to do an advanced apprenticeship. Rush encourages that candidates looking to go straight into a hairdressing role need to have gained previous salon-floor experience. The length of time it takes to complete an apprenticeship can vary. At Rush apprenticeships are generally 18 months long. One you have completed your apprenticeship and you pass, you are guaranteed a job with Rush. This is one of the most popular and successful routes into hairdressing. 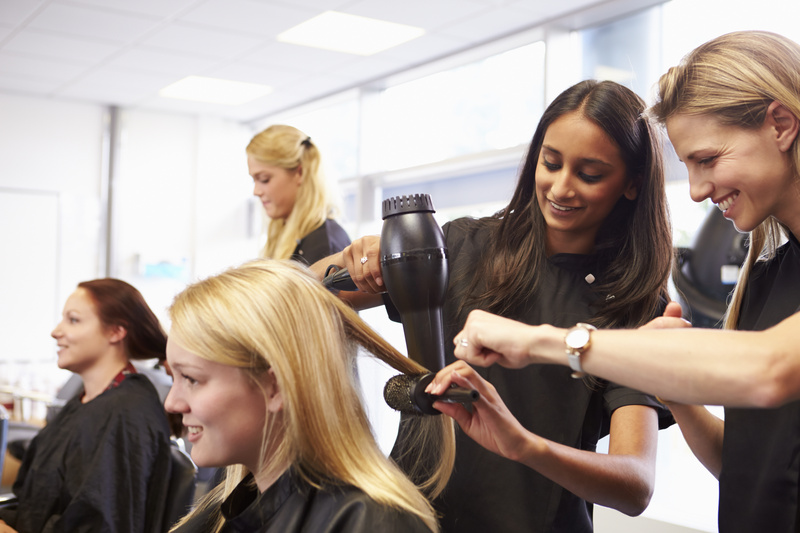 NVQs (National Vocational Qualifications) are the standard accreditation for hairdressers in the UK. In Scotland, they’re called SVQs (Scottish Vocational Qualifications). A level 1 NVQ certificate in hairdressing will help to kick-start your career; with it, you’ll be able to work as a hairdressing assistant. But to be recognised as a competent hair stylist in your own right, you’ll need to achieve a level 2 NVQ certificate (to be employed as a junior stylist). Senior stylists should have a level 3 certificate in hairdressing. Level 4 NVQ certificates are ideal if you want to gain specific hairdressing and barbering skills. You might want to provide colour correction services, for example, or be interested in treating hair and scalp conditions. This qualification is made up of smaller, work-based learnings; it’s suitable for those who are new to the industry, as well as anyone working at a more senior level. Foundation degrees are higher education qualifications that are designed with industry professionals. They can be studied full-time (which usually takes around 2 years to complete), or combined with work placements and completed in 3-4 years. Once you’ve completed a foundation degree, there is the option to keep studying and gain an Honours degree at university. This can take just 12-15 months, instead of the 3-4 years it’d usually take students to complete a bachelor’s degree. Honours degrees in hairdressing often focus on more specialised aspects of the industry, such as hair styling and makeup artistry for TV and film. Whatever route you take, a career in hairdressing comes with flexibility and the chance to continuously develop your skills. Whatever stage you’re at, join our award-winning team at Rush to get the most out of your hair or beauty career.